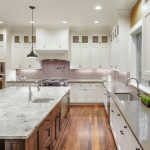 Need help with your granite kitchen countertop project in Columbus, Ohio? Give us a call at The Granite Guy! Installing granite kitchen countertops is one of the best investments you can make for your home. However, the process of selecting and installing them can be misleading and confusing. So here are a few ‘showroom to installation’ tips to help you maximize your investment. Visit the Showroom: Begin the process by visiting a fabricator’s showroom where you’ll be able to see sample slabs of granite and learn about granite countertop prices. Of course, costs will differ depending on the stone you choose. Choose a Sink: For granite kitchen countertops, a stainless steel undermount sink is the most common choice for aesthetics and practicality. Some home improvement experts recommend a 16-gauge unit because it’s thicker and more resistant to dents. Before choosing one, think about your kitchen habits because undermount sinks come in many sizes and shapes. Decide on a Backsplash: Do you want a backsplash to match your granite kitchen countertops? Today, most kitchens have backsplashes that start at the countertops and continue to the upper cabinets. Faucet Layout: The fabricator of your countertops will need to know the number of holes to be drilled in the granite, and therefore may wish to see a specification sheet for the faucets you have chosen. Installation Day: Your fabricator will bring the slabs for the granite kitchen countertops to your home and install them. Usually, the job can be done in a few hours, but you will probably have to wait 24 hours before the faucet can be installed and the sink drains connected.